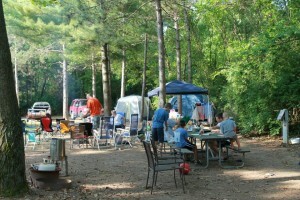 Up until this past weekend, my family and I have gone camping with other families when we go. This time, though, it was just the four of us. 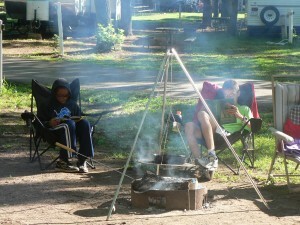 My boys were forced to redefine what camping meant to them. Before, camping meant spending time with friends generally their age. It meant more than being just with the people with whom they live and spend their daily lives. When they found out this trip would be “just the four of us,” both boys seemed at a loss of what we would do to fill the time. In other words, they were certain it would be boring. When I saw their disappointment and the anticipation and excitement drain from their eyes, a determination rose up in me to show them how to choose to make a disappointing situation become a memorable experience. I don’t like it. I don’t eat much of it usually. Yet, so many of life’s pleasures have it. At some point, I simply came to terms with the idea that letting my kids have s’mores with Reese’s Peanut Butter Cups and chewy chocolate chip cookies wasn’t being a bad mom. It’s creating a memory that will span generations. Besides, it’s not like we have them for breakfast. (Okay, maybe cookies once, but that’s it.) The point is that having treats like this goes a long way in making the trip memorable for my family simply because it was special and not something they normally get. Making popcorn over a campfire in a coffee can. Cooking almost all our meals over the fire. Watching things melt. Yes, we probably sometimes broke the rule to not play with fire, but at least it was contained. 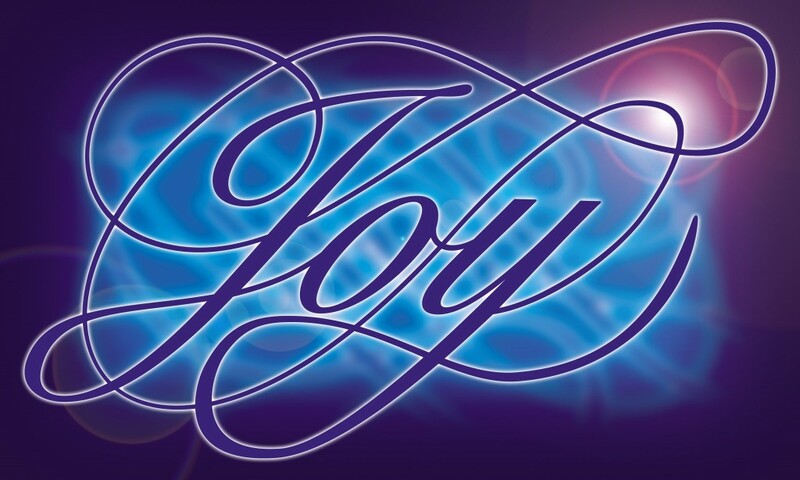 All campers are captivated by this element around which all campsites center. 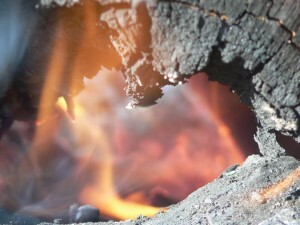 As we sat there at various times during the day and every evening, we constantly ended up“fanning the flames” of connection in our family in some way. (Check out 1 Timothy 1:3-7 for added emphasis on the importance of family connection. )We remembered a lot of fun times, we joked, we talked about when my husband and I were kids, and we even talked about books and movies. And at some point we got to words that might not have ever been said in the company of others or even at the dinner table at home. Family words spoken in the dark as we watched the fire. We spent a lot of time just sitting and relaxing or reading, but a large part of this trip was about activity. Most of this activity necessitated family interaction. Corn hole. Bike rides. Walks. Swimming. We competed with each other, and we even trash talked some. Movement together as a family leads to compromise, conflict resolution, preferring and encouraging. At home, we can find separate corners of the house when irritations arise. While camping, there’s no real getting away from one another. Camping can promote much-needed interaction as a family, especially in the absence of electronics (which I highly recommend, by the way). Seems silly to bring sugar, fire and movement together in a post reflecting on my weekend, but as I think about this past weekend and what we did to create memories, I realize that these three elements really came together to allow us to be fully present as individuals in a family unit. They helped create an atmosphere that allowed each one of us to enjoy every moment together. Which brings me full circle to turning disappointing into memorable. The elements that seem essential for that recipe include being fully present, doing something special, creating the right atmosphere, moving together and preferring one another. Sure, there are tons of ways to create memories as a family, but don’t they all really contain the same ingredients? What ingredients am I missing? Dirt everywhere. Bugs too. Five minute walk to the bathroom. Very little privacy. Meals made over a campfire or on a propane stove. Cooler for “fridge.” Loud neighbors. Sleeping on a semi-comfortable air mattress. No air conditioning. Personally, camping is not my thing. So, why? Why subject myself to two poor nights of sleep along with almost constant social interaction (not easy for an introvert)? Simply put, my husband and boys LOVE camping. On this past trip, the realization hit me that my efforts toward the camping experience were kind of pathetic. Just going did not seem like enough, especially with the words of 2 Corinthians 9:8 in mind. For this reason, I decided to consider the benefits of camping beyond the obvious of honoring my family. My Everyday God once again showed me more than I expected. I am realizing that if I get over myself and my expectations, camping can enhance other areas of life tremendously. Fellowship. We camp with friends, usually families from church. We have spent time together at church as well as church-related activities and even at each other’s houses. But something about spending two days together, talking at the campfire each night and seeing each other at our morning bests creates a deeper connection. Family. Take away video games, computers and phones. Take away toys and television. Minus housework and yard work. All excuses removed for why you can’t spend time together as a family. 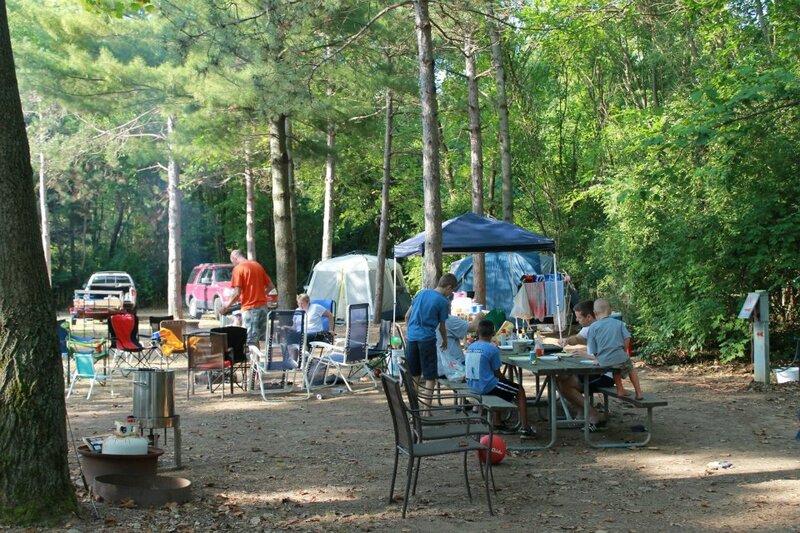 Camping returns a family back to the basic of enjoying each other in simple ways. Faith. Spending time in nature always increases my faith, and camping certainly is all about spending time outside. Walking trails. Enjoying sounds of animals. 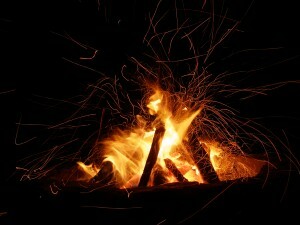 Watching the campfire. Something about camping brings out my introspective nature and opens me more to the voice of God. 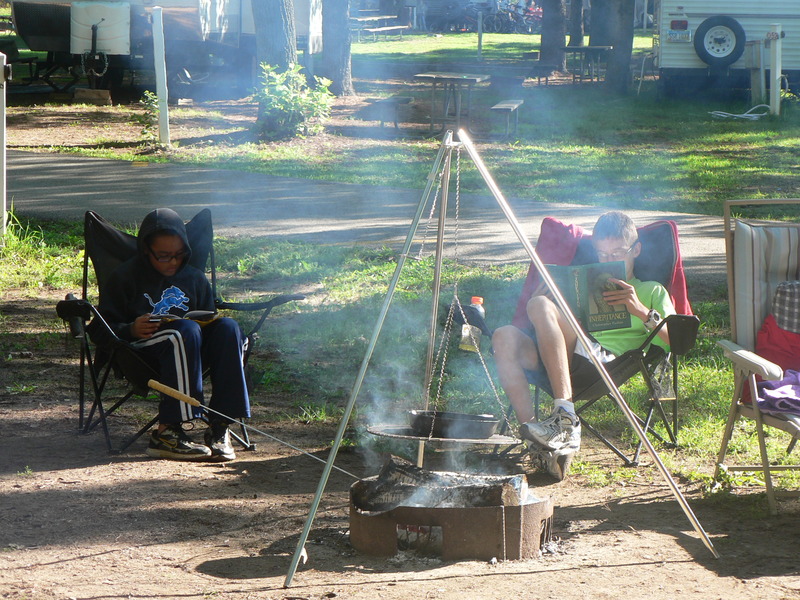 These three crucial aspects of life seem to get a much-needed focus when camping. Maybe it’s the minimal distractions. Maybe it’s the simplicity of eating. Maybe both. personal reflection and relaxation that few other settings can provide. Reflection. Think you’re doing pretty well in how you treat others and with humility? Feel like you do well with thinking of others before yourself? Camping gives a status check in these areas. How do you react when other campers are louder than seems appropriate? What about when people act as if they’re in their own back yard and seem to forget the existence of other campers? Do annoyances and small conflicts serve to separate or create greater bonds? Any expectation of personal privacy or routine must give way to flexibility. The only other options are unhappiness, irritation and even alienation. The choice comes down to being right or having relationship. This deeper look at camping has helped me realize that a change of venue to a simpler life allows perspective that only this simpler life can provide. Camping forces me to get outside of my silent, orderly world and into the world of interacting with others in a way that can strengthen and deepen bonds when flexibility and grace guide attitude, actions and words. Maybe you don’t struggle with camping like I do. But you do have a “camping” issue in your life. Everyone does. How do you personally relate to my struggles with camping?